Saute the onion in a little olive oil until soft and beginning to turn translucent (3-4 minutes). Add the garlic and cook another minute. Add in the peppers, spices, and tomato paste and cook a couple minutes longer. Dump in a bottle of the pumpkin beer and bring to a simmer. Cook for 4-5 minutes. Stir in the beans, tomatoes, and pumpkin. Add one cinnamon stick. Cover and cook for about 15 minutes. Remove cinnamon stick and cook an additional 30-40 minutes. Ladle into bowls and garnish with cilantro, shredded cheese and a dollop of sour cream (try adding a little adobo sauce to make it chipotle flavored). To keep it vegan, simply omit the sour cream and cheese (or use a vegan substitute). You know the drill...the leaves begin to change into a rainbow of reds, oranges, and yellows. You can feel that bite in the air. You start making chili and soup. Fall. It's officially here! It comes as no surprise that October is National Chili Month. 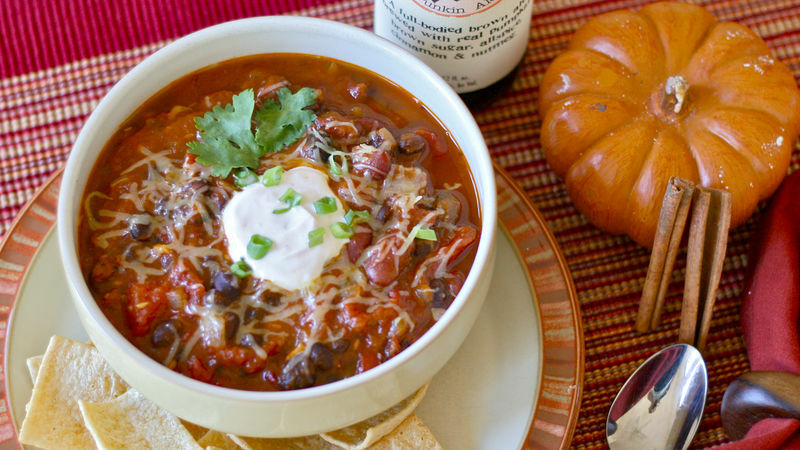 Autumn and chili go together like...well, like autumn and pumpkins. So why not marry these two quintessential fall foods into one delicious, hearty and healthy comfort meal? I did a meatless chili for this recipe to really highlight the pumpkin flavors, but feel free to add ground beef or ground turkey. (A good use for Thanksgiving leftovers!) Tomatoes, two types of beans, and three types of peppers help round out the flavors and “beef” up your chili without using meat. The pumpkin in this dish is subtle – I only used about a half a can. But it adds a thickness and creaminess that I love in a good chili. It also contains lots of fiber, so that ups the health factor as well. Saute the onion in a little olive oil until it's soft and starting to turn translucent (3-4 minutes). Add the garlic and cook another minute. Stir in the beans, tomatoes, and pumpkin. Add one cinnamon stick. Cover and cook for about 15 minutes. (BTW...your house will smell heavenly.) Remove cinnamon stick and cook an additional 30-40 minutes.